On the way back to my hometown during the recent school holidays, we stopped in Kuala Kangsar for one night. 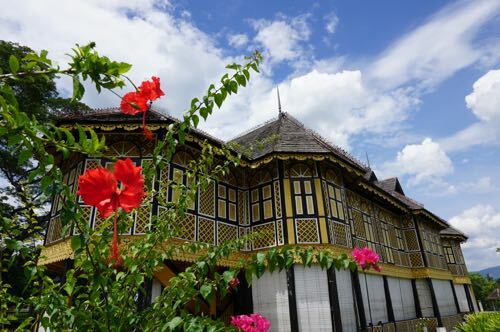 Kuala Kangsar is famous as it is the royal town of Perak and also because of it’s close proximity to Lenggong which is famous for Perak Man, the country’s oldest prehistoric man. This is the first time I visited Kuala Kangsar despite several previous attempts to visit this well-maintained historic town. The locals are chatty and friendly. To allow us to see more things along the way, we purposely took trunk roads (exiting Ipoh from Kuala Lumpur from PLUS highway) passing through Chemor, Sungai Siput before reaching Kuala Kangsar. For lunch, we stopped in Chemor for seafood noodles at Hoong Wan Restaurant. J and K were not impressed with the eatery as it is dirty and noisy. While the food there is much cheaper, I don’t recommend it as it is not as good as I expected. 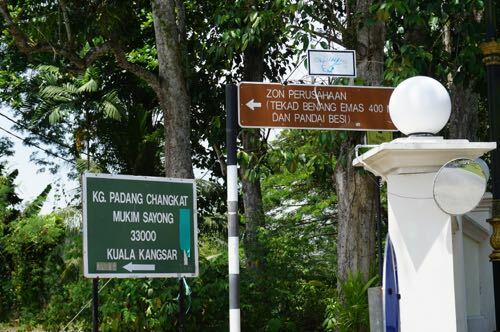 Before we reached Kuala Kangsar town, I saw a signboard pointing to right to Victoria Bridge. 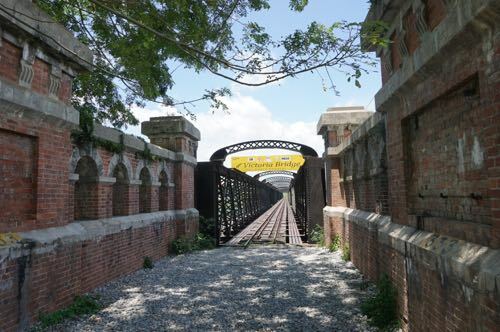 I quickly made a U-turn and headed to the first railway bridge in Malaysia. 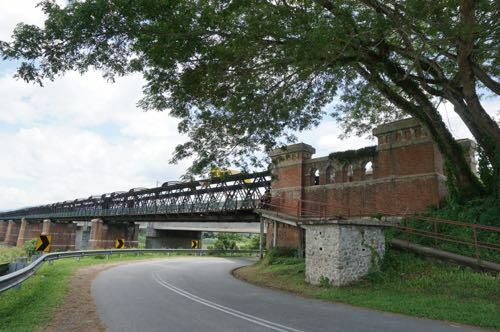 The 1900 completed bridge was built to cross Perak River to serve local mining industry. 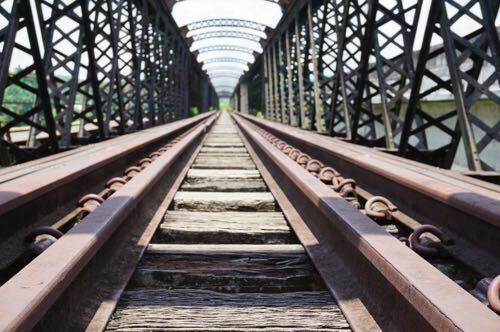 The single track railway is not used today as it’s replaced by another new track which is parallel to Victoria Bridge. It might not be as grand as Sydney’s Harbour Bridge, but the Victoria Bridge exudes its own uniqueness and beauty. 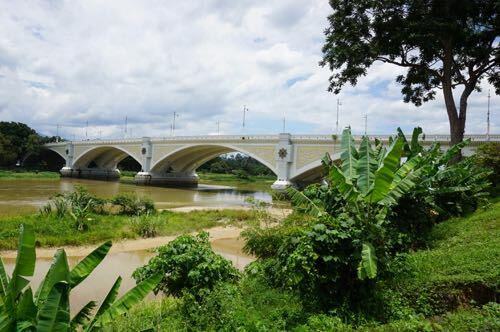 The bridge is located in the outskirt of Kuala Kangsar on the other side of Perak River, about 10 minutes of drive from town, in a small village called Karai near Enggor. You have to pass through the Karai town (on the way to Kampung Loh) before you can see the bridge. We saw the signboard leading to Sayong Industrial Zone but we somehow got lost as we neared the village and no proper signage was put up. Without guidance, we had to use our intuition to find the place where the pitchers were made. 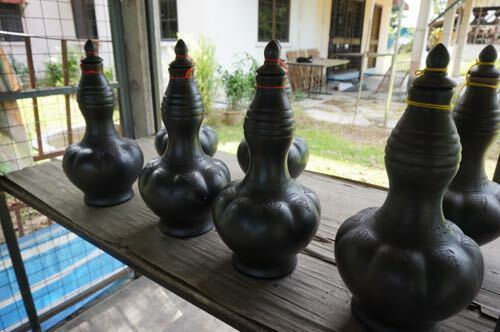 Labu sayong is used to store drinking water and it’s said the water will be as cool as if you keep the water in the fridge. I thought there were many shops/workshops that lined the street but we only managed to find one that was open that day. 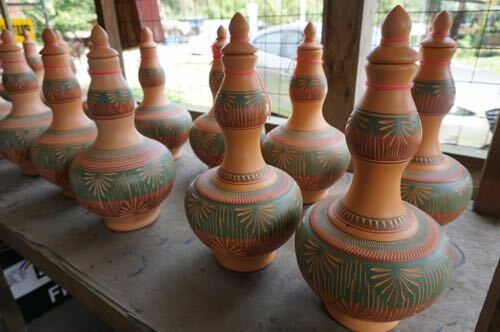 The earthenware labu sayong is what Kuala Kangsar is famous for. We expected labu sayong to be expensive since it’s handmade but it’s only RM15 a piece. We didn’t get to see how labu sayong was made as many workshops were closed for Aidiladha holiday. 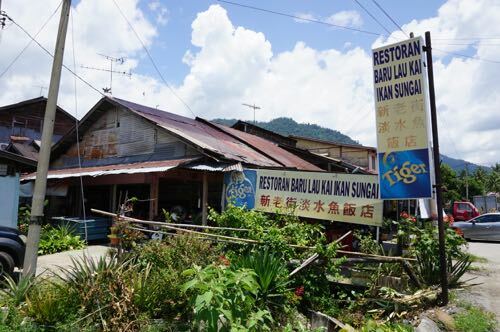 The labu sayong village is located over on the other side of Sungai Perak called Sayong. But due to lack of signage, we were unable to find the cluster of workshops but one. We crossed to Kuala Kangsar town from Sayong by using Sultan Abdul Jalil Bridge (Kuala Kangsar’s own version of London Bridge). 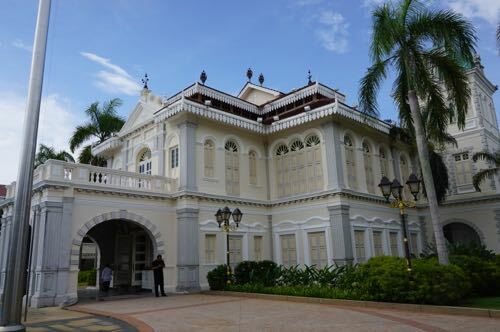 Once you reach the roundabout with clock tower (the only one in town) from the bridge, take second exit to go to Bukit Chandan – a hill where all the enchanting palaces with fine architecture located. Following along the street, you’ll see Galeri Sultan Azlan Shah on the right first. We drove along and then saw one of the most beautiful mosques in Malaysia: Masjid Ubudiah. Ubudiah Mosque is Perak’s royal mosque and it was completed and officially opened in 1917 by Sultan Abdul Jalil Nasaruddin Shah. 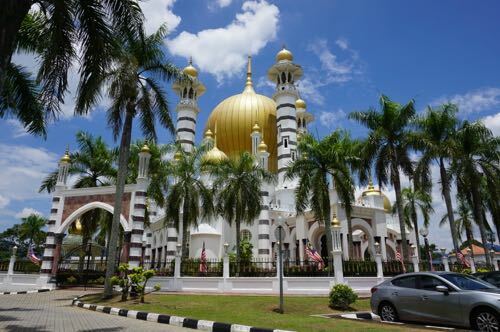 This golden-domed mosque is one of the most popular landmarks for Kuala Kangsar. Just a few blocks away after Masjid Ubudiah, heading to the peak, on your left, you will find an abandoned old Malay house called Baitul Anor. 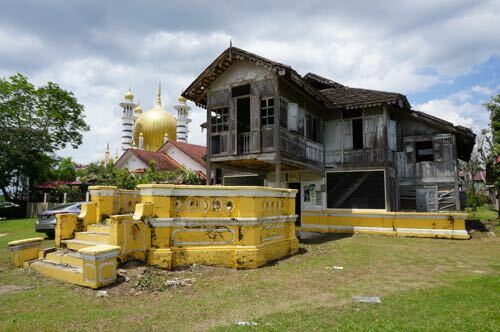 According to some write-ups, this half cement, half wooden house used to be the home to the third wife of Raja Kechil Sulong Harun Al Rashid. One thing you won’t miss is the striking yellow balcony in front of the house. 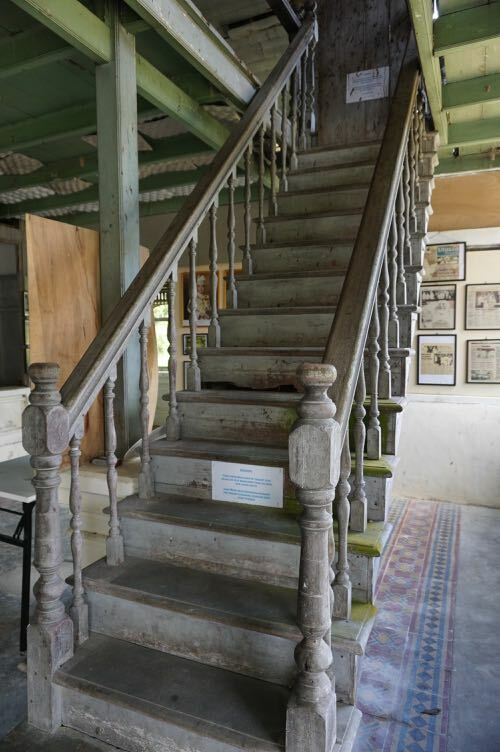 There are some exhibits inside this unattended old mansion. I think this old building deserves much better conservation and maintenance from the relevant authorities if they want to keep it for many years to come. 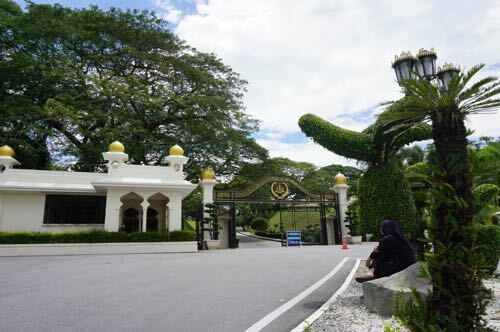 Further up Bukit Chandan, you will bump into a huge gate, an entrance (rarely opens) to the current palace of Sultan of Perak in Kuala Kangsar. Surrounding Istana Iskandariah is a one-way street that goes clockwise from left to right side of the gate. There’s another entrance down the road. I got to know from a policeman at the guard house, Sultan of Perak spends most of his time in Kuala Lumpur. His Majesty rarely comes to Istana Isknadariah, at least not as often as his father, the late Sultan Azlan Shah. It’s a white palace with a huge compound and you can only view Istana Iskandariah from far. After you have made a full circle around Istana Iskandariah, take a left turn and you’ll be mesmerised by a yellow and black architecture. That’s Istana Kenangan. 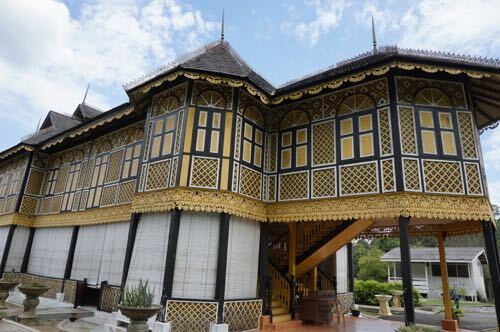 This wooden palace (yes even the roof made of wood) used to be a temporary palace while the Sultan was waiting for the nearby Istana Iskandariah to be completed. 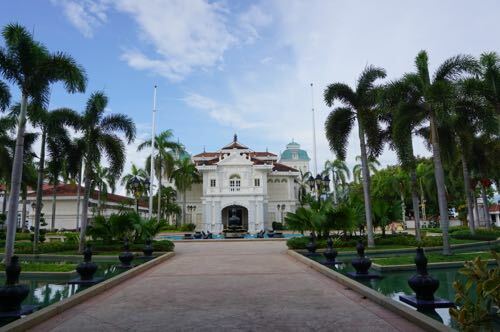 The palace-turned-museum was built in 1926 under the instruction of Sultan Iskandar. The palace was built with joint wood without using a single nail. 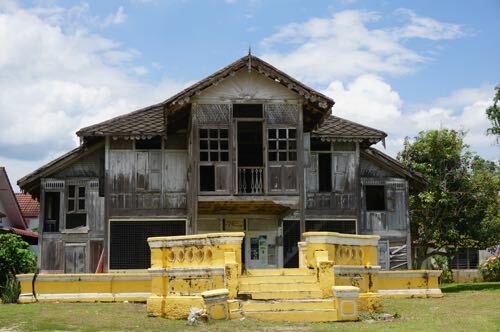 The design of this palace will just blow you away and it has become one of the icons of Kuala Kangsar. You can only admire the building from outside in the compound as visitors are not allowed to enter the palace. We had tea before we visited Galeri Sultan Azlan Shah so that we would have the energy to tour the royal gallery. 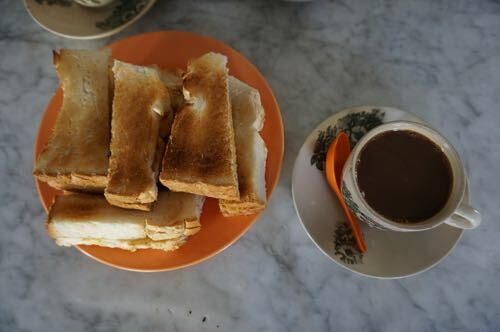 The no-frill afternoon snack is none other than coffee/tea and toast (roti bakar). 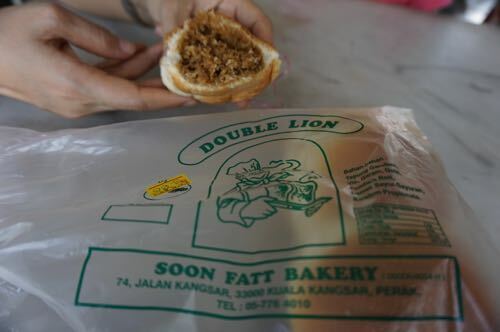 Soon Fatt Bakery is famous for Hainanese bread. You can actually dine at the back of the hotel. The place was open and windy for a traditional afternoon tea of toast and coffee. 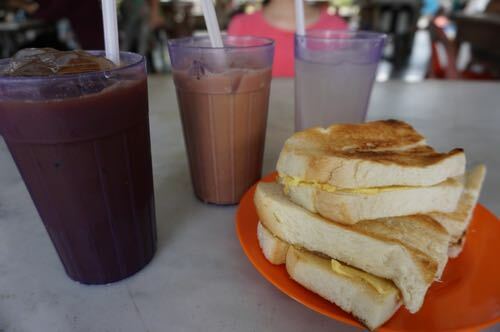 The coffee and toast, in my humble opinion, are better than Restoran Yut Loy (that located not far from Soon Fatt). We ended up here because Yut Loy was closed on that day. 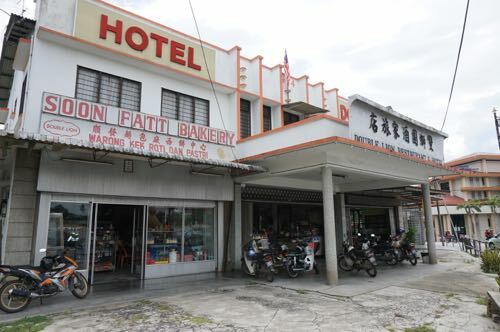 Don’t be confused as the three shops under the hotel are selling the same bread made by Soon Fatt. So it doesn’t matter where you order your toast, it’s the same. I really enjoyed the toast there. Address: 74, Jalan Kangsar, 33000 Kuala Kangsar, Perak. I must say the highlight of the day is the visit to Galeri Sultan Azlan Shah. I was told the building used to be a palace before it was turned into a gallery. We spent roughly 1.5 hours touring this enormous gallery that showcases the private collection of the father of the current Sultan of Perak, Sultan Azlan Shah. From his official attires to his collection of Olympic memorabilia to keris collection. Souvenirs that Sultan Azlan Shah received from other heads of government while he was the Sultan and the King of Malaysia are also on display. 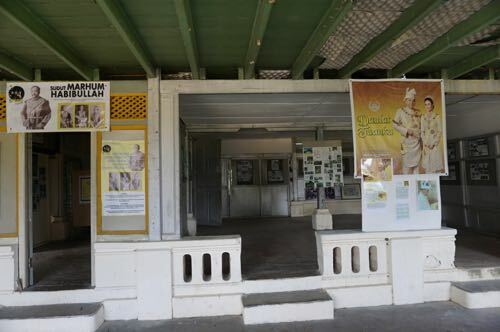 There’s another block in front of the main gallery that displays Sultan Azlan’s official and private cars. The gallery is so big that we got so tired after the visit. Visiting this gallery is a great way to take a peek into the life of a sultan. Tickets: RM4 for adults and RM1 for children below 12. 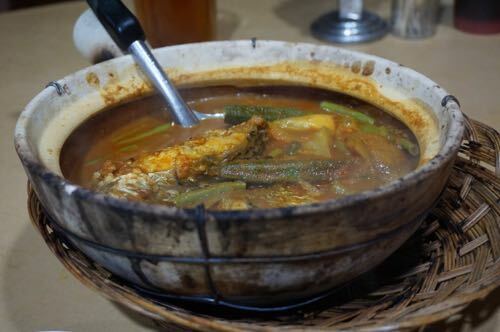 Before I went to Kuala Kangsar, I already knew that the royal town is famous for its laksa and cendol. Why not? 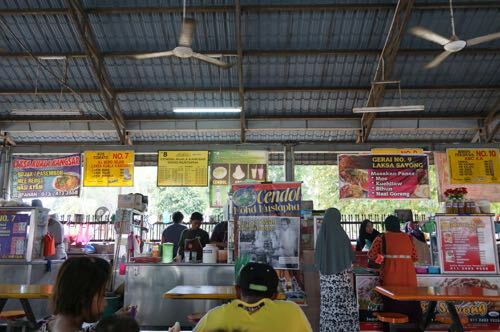 It has a building dedicated to these two cuisines and it’s called Medan Cendol dan Laksa Kuala Kangsar. Since we were there, how could we miss them? 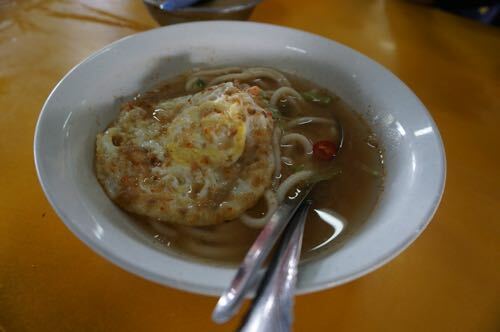 It’s common to have hard-boiled egg for laksa in other parts of Malaysia but I have never tasted laksa with fried egg. 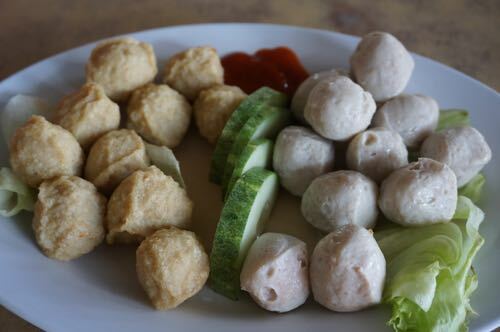 This combination is very common in Kuala Kangsar. My wife loves it as laksa and fried egg combines perfectly. As for cendol, I still like the Penang version though there’s no harm trying KK cendol. The foodcourt is located in the town area. 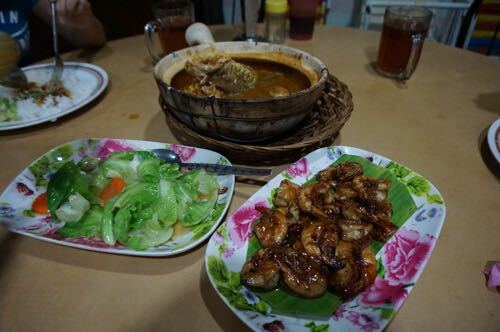 I read from a blog (I can’t remember which) that the blogger mentioned you can enjoy Nyonya food in Kuala Kangsar. We patronised Sudut Nyonya as our first choice for dinner Uncle Jimboy was closed. When we stepped in, we realised that the sign said “Close.” But we entered somehow. I asked the lady boss if they still served dinner. After some thoughts, she was kind enough not to let us starve. It turned out it was the best food decision that day as everyone enjoyed thoroughly the sour and spicy dinner. Not only was the food tasty, it’s also cheap. We chatted with the friendly lady boss and sad to find out that the simple restaurant will be closing down after next year’s Chinese New Year. 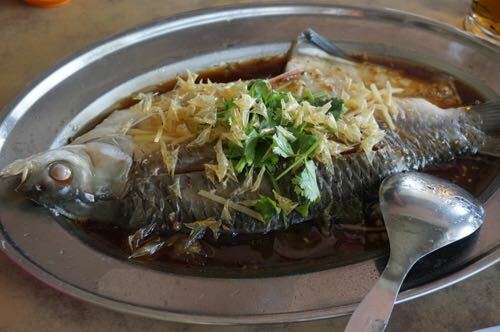 It’s been in operation for more than 25 years and it survives until today as it alters its menu to suit local people as they are not open to authentic Nyonya food. 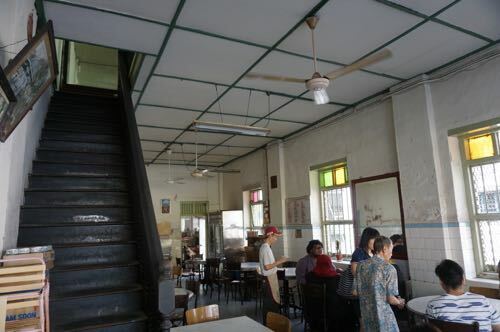 On the following day, we had breakfast at Restoran Yut Loy after making a call to make sure it was open. The famous coffee shop is in its third generation of operations. The restaurant only serves halal food and seeing Muslim customers in this Chinese-run coffee shop is a common sight. Unlike in the afternoon (after 1pm) which the coffee shop serves lunch with its mouth-watering Hainanese chicken chop (RM19), steak, fried noodles, and Hainanese paus (steamed buns, after 2pm), you’ll find only toast and eggs in the morning. Paus are available in red bean and kaya (RM2 each); chicken and beef (RM2.30 each). Personally, the toast is okay but Soon Fatt fares better. We reserved some paus to collect in the afternoon. I find the chicken and red bean are good. 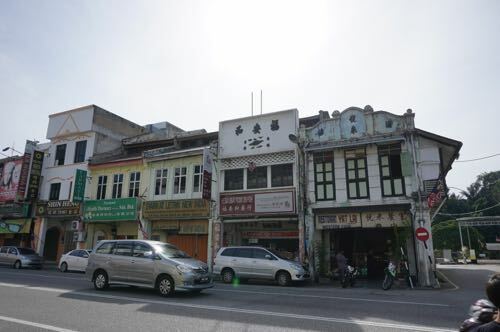 Address: 51 Jalan Besar, 30010 Kuala Kangsar, Perak, Malaysia. 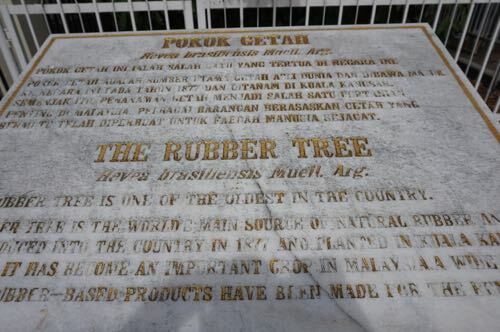 One of the oldest rubber trees that were brought into Malaya can be found in Kuala Kangsar. 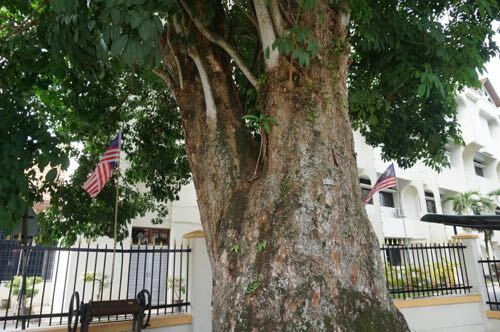 It still stands tall and growing and it’s located next to Land Office of Kuala Kangsar (Pejabat Daerah dan Tanah Kuala Kangsar). According to the plague there, the tree was planted in 1877. From then on, Malaysia became the world’s biggest exporter of natural rubber. Don’t want to waste time just looking at a rubber tree? 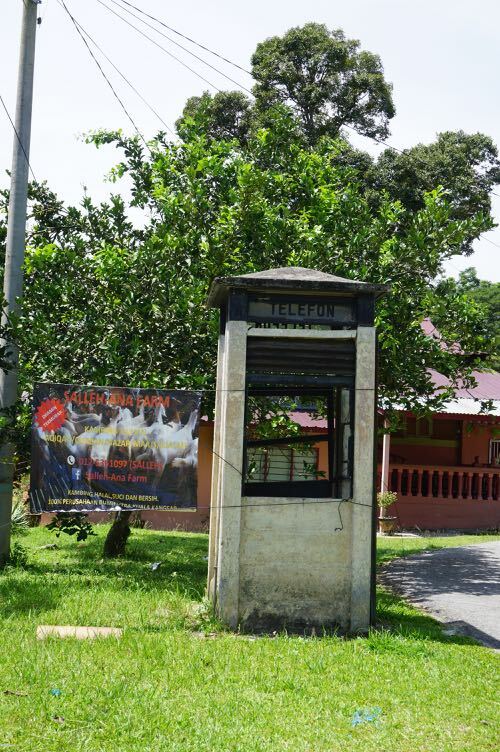 Fret not, nearby located a prestigious school not only popular in Kuala Kangsar but in Malaysia. Many family members of the royalty and famous politicians had attended this school. 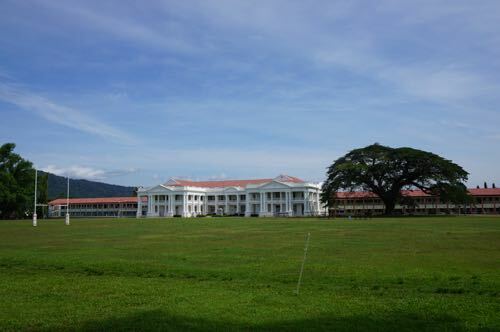 It’s Malay College Kuala Kangsar. I can’t stop admiring the main building’s architecture. 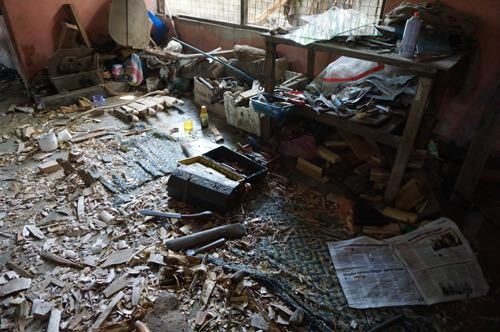 There’s only one place in Perak where you can find a keris master crafter. 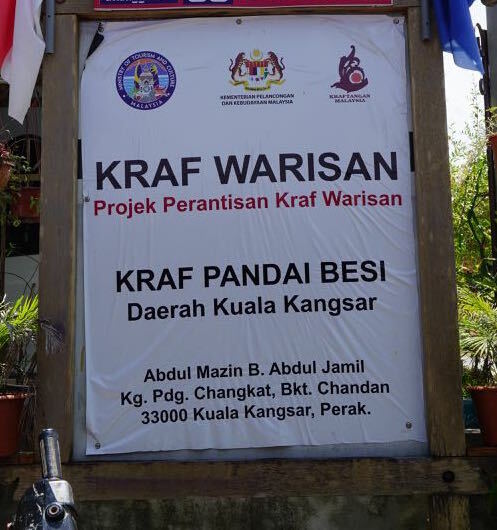 That’s in Kuala Kangsar. Kampung Padang Changkat to be exact. A keris is a Malay dagger and it’s synonymous with Malay culture. We almost left KK without visiting the famous keris maker as we were not sure where he was located and we couldn’t find him on Waze. Luck was on our side as a labu sayong seller told us that the keris maker lives near Istana Iskandariah. We quickly began our search for the master’s workshop and we found it. To go to the village, one needs to take a left exit after the main entrance to Istana Iskandariah – that is a half-circle through the palace. The master, Pak Mazin, was not in as he was somewhere celebrating Aidiladha but his son was around. 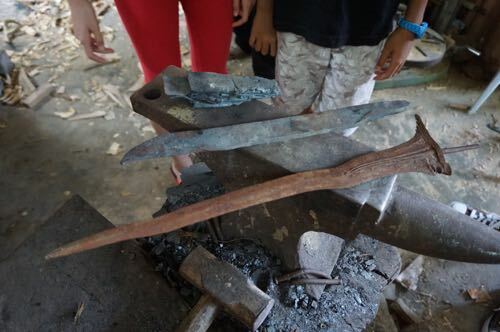 Hazrin was so kind to let us in and showed us how a keris was made in a small workshop. 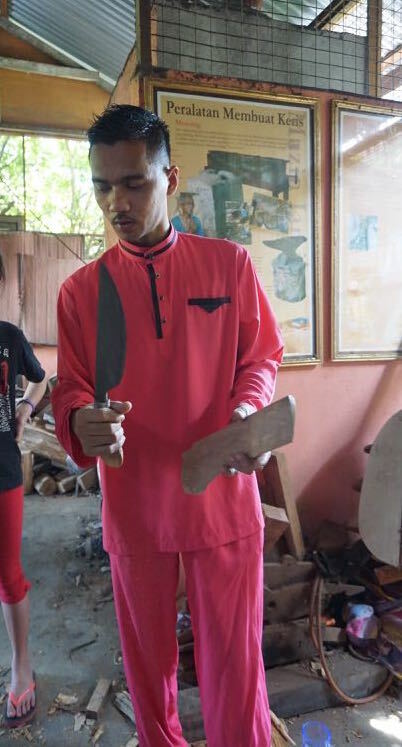 He is the fifth generation of keris-making family. The workshop gets a little messy. Watch your steps if you are there. And the family lives just next to the workshop. This is no ordinary keris master as they receive orders from keris collectors, the sultans and even the King. Our original plan was to stay in Sauk. But the homestay was full that day and we were forced to look elsewhere for accommodation. 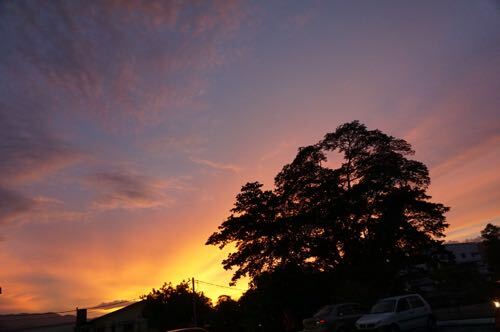 It was a blessing in disguise as later we found out Sauk New Village is 20 minutes away from Kuala Kangsar town – where all the action is. We made a trip to Sauk anyway as we wanted to check out the village (I’ve never heard of the place before) and it’s famous for river fish. On our second day, we purposely made a trip there for lunch. 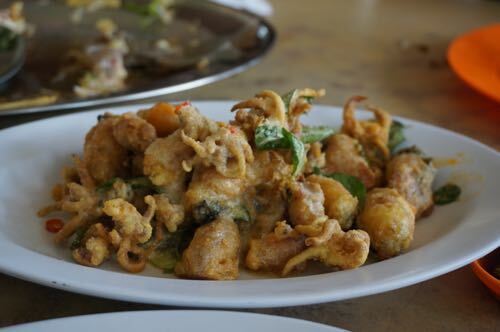 Sultan fish with crispy scales as topping! Of course, river fish was ordered, among other things. 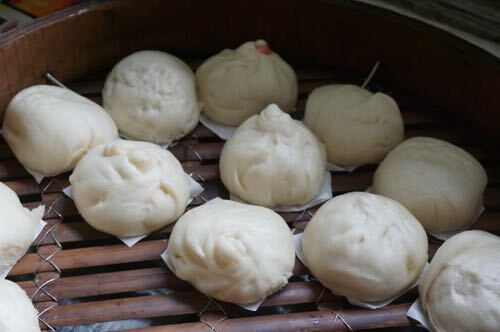 In fact, there is more than one restaurant that serves similar food. 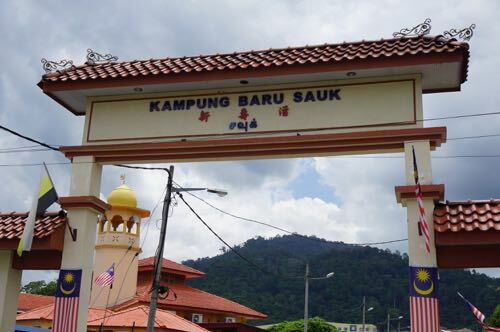 Sauk is just a small village of farmers, north of Kuala Kangsar, and it’s a stop-over town for visitors heading Lenggong, Grik, or even Betong of Thailand. Address: S-22, Kampung Baharu, 33500 Sauk, Perak, Malaysia. 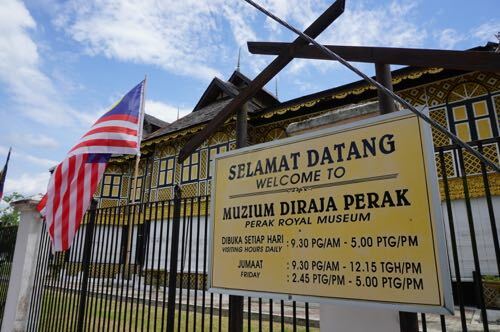 Note: We wanted to drive further up north from Sauk to Lenggong Museum for the famous Perak Man but we came to know that the center is closed for renovation until May 2017.